Civil War – Patrick F. Clarkin, Ph.D.
Red States versus Blue States: Who Would Win a Civil War in the U.S? 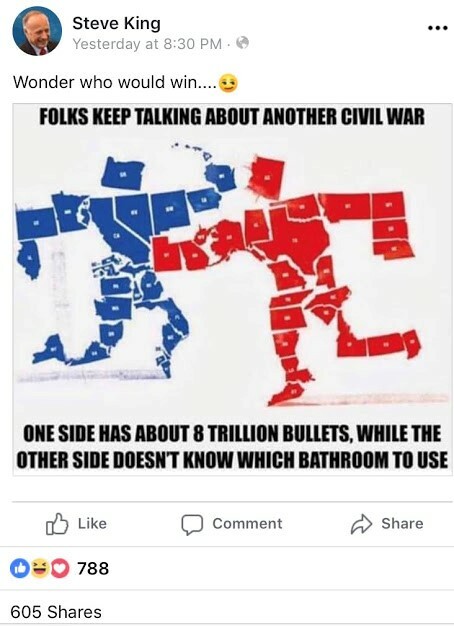 Last week congressman Steve King, a Republican from Iowa, created yet another controversy by posting an image on social media that asked whether red states or blue states would win in a second U.S. civil war (the clear implication is that the red states would). Understandably, King received a lot of criticism for this, for contributing to a political ecosphere that is already steeped in heated rhetoric, in which real political violence has been on the increase. King has since deleted the image, but he is not alone. With anxieties and polarization growing, talk of a possible second civil war in the U.S. is still relatively rare, but I can’t recall another period in my lifetime where I’ve heard it with such regularity. Even Stanford’s Niall Ferguson has written about this. Others have opined on King’s glibly pondering civil war as a sitting member of Congress, the fact that he overlooked the fact that his own state is “blue” in the image, his transphobia, or his timing (the post came just a day after a white supremacist killed 50 people in New Zealand mosques). I’d like to focus on the idea of “winning” a civil war. First, a step back. The way that we initially frame a question has a big impact on our thinking. As the linguist George Lakoff wrote around the time of the First Gulf War, “metaphors can kill.” To frame war solely in terms of winning and losing (ex. an image of two boxers) does a great disservice to what actually happens during wars. Lakoff continued: “It is important to distinguish what is metaphorical from what is not. Pain, dismemberment, death, starvation, and the death and injury of loved ones are not metaphorical. They are real and in a war, they could afflict tens, perhaps hundreds of thousands, of real human beings, whether Iraqi, Kuwaiti, or American.” Certainly, the same suffering would apply to a civil war in the U.S. Historical Lessons: How Destructive Would a Civil War Be?